In January, I was lucky enough to travel to Sydney, Australia, on a work trip. 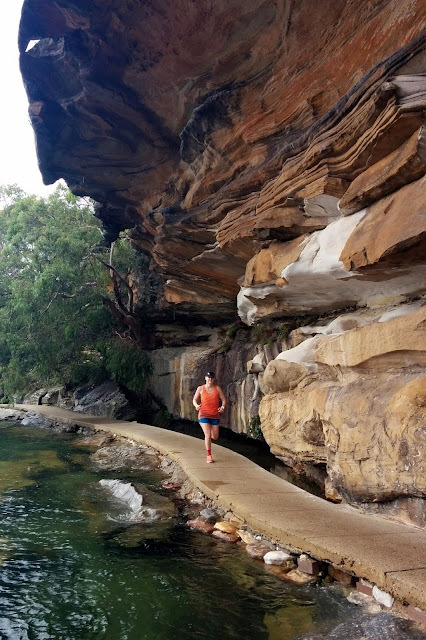 I've been working with a Sydney-based team for the past few months, and it was wonderful to have time with them in person and to see how challenging the remote time zone can be. And of course, I had a fantastic time seeing a new country and a new part of the world! Despite the fact that I'm afraid of flying, I was strangely not nervous for this trip. I was excited because I had a business class ticket on Air New Zealand and I'd heard rave reviews of their services. They definitely lived up to the hype - great food, good wine and beer, nice lay flat beds, and awesome customer service. It actually made flying enjoyable. My flight left on Thursday around 7 pm and I had one layover in Auckland, NZ. Socks to keep the feet warm, provided by Air New Zealand. The final part of the meal: cheese, crackers, and port. So good. When I arrived in Sydney about 16 hours later, it was Saturday morning. My Friday disappeared into the magical International Date Line which was SO ODD. I didn't want to sleep so I did the next best thing and went running. I love exploring new places on foot this way and it gives me the lay of the land immediately. 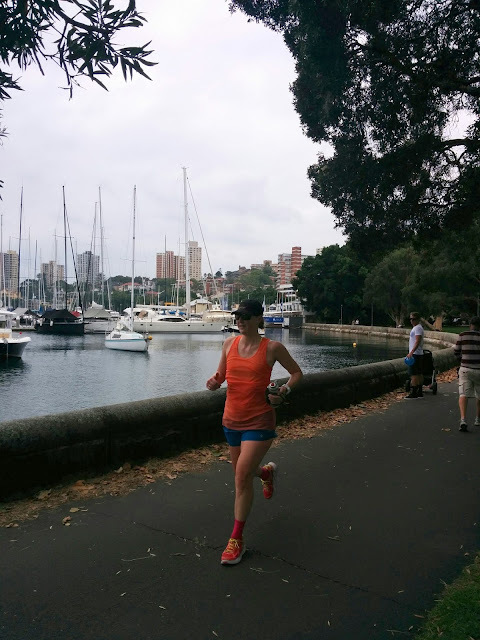 The hotel was near Darling Harbour, so I ran along the water and the wharfs, through a couple of cute parks and to see the Harbour Bridge. Australia Day flags along Darling Harbour. View of the Harbour Bridge. 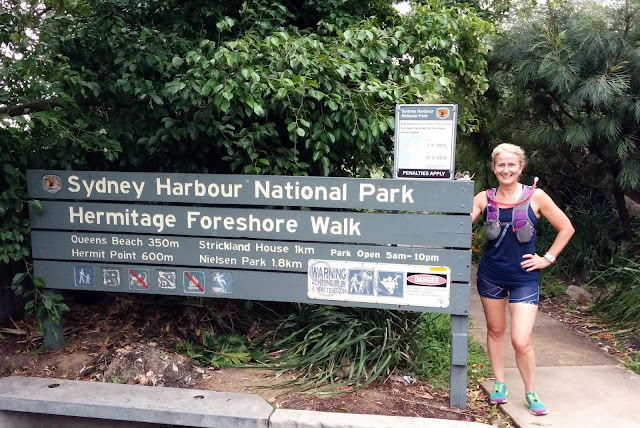 On Sunday, I went with Catherine and Sally for an awesome run in Royal National Park; I met them both at Bird Camp in Leavenworth over the summer. The park was about 40 minutes drive outside of the city and is huge. We saw only a very small, but beautiful, section of the park called Lady Carrington Drive. Sally had headed out with an earlier group so we only ran with her for a few miles after she turned around, but Catherine and I did 10 miles total that day. The run was along a wide, fire road type path through the park. It felt like a rainforest, complete with fancy birds and Eucalyptus trees. The view along Lady Carrington Drive. Tall rock structures along the way. Running with Catherine and Sally. After the run on Sunday, I did a little shopping and visited the National Maritime Museum. The museum was worthwhile, and the highlight was the opportunity to tour a ship and submarine. I've been on a number of ships, but that was my first submarine. Into the submarine we go. Me, manning the torpedo controls. On Monday, I headed to the office via a nice walk along Darling Harbour. Now that's a commute I could get used to! In the following days, I had some beautiful morning runs before work. The time zone made it feel like we were 5 hours behind (although it's actually almost a day ahead), so getting up early was easy. My co-worker, Sophia, climbing the hill under the Harbour Bridge. View from the top of Barangaroo Reserve. A foot path along the water in the Botanical Gardens. More of the Botanical Gardens. Imagine my surprise when I turned a corner in the gardens and saw this view! View running back through Circle Quay. Work was also fun and eventful during the week. I held my first parrot, enjoyed amazing views from the cafe, tried kangaroo steak, had Dim Sum for the first time, and took a team outing to Manley Beach. On Friday evening, Sophia and I went to see La Bohème at the Opera House. The Sydney office wins for best elevator decor. View from one of the cafes. I stayed for the weekend after my work time finished, which was the best decision ever. By Saturday I was very tired and overslept for the the morning trip to the zoo with my co-workers, but I took myself on a fun run across the Harbour Bridge. That was one of my trip goals so I'm glad I made time for it. I ended the run at Lord Nelson Brewery for curry and local beer. Lord Nelson Brewery had pretty good beer and great atmosphere. Exterior shot, loved the character of the building. 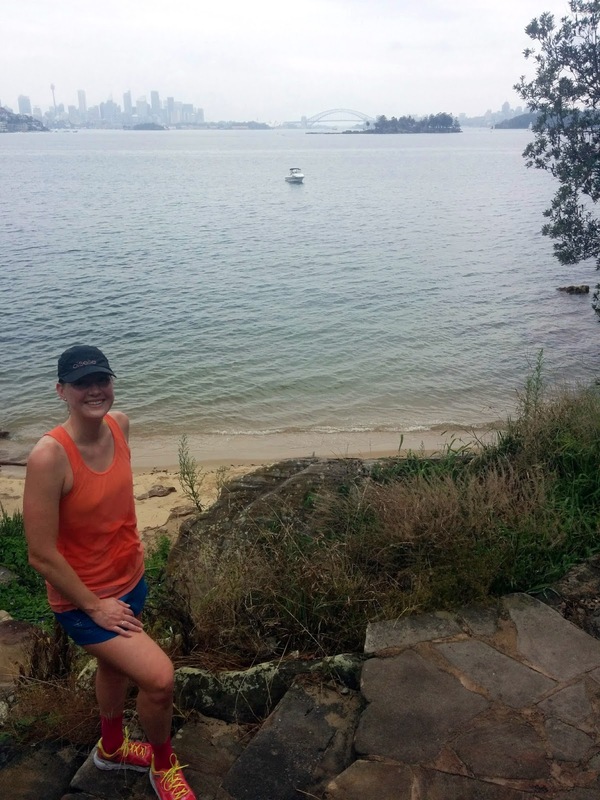 My last day in Sydney was Sunday, and I had one last, epic 14+ mile run with Catherine before leaving Australia. She took me to a beautiful coastal area, through fancy movie star houses, and to a beach. We stopped for coffee and a pastry at a park cafe with a beach view - a first for me during a run! I'm so thrilled I was able to spend time with her again for running and coffee. She also took some great running photos for me! The next morning I began my journey home. I had a longer layover in Auckland this time, where I enjoyed the fancy Air New Zealand lounge. It was complete with great beer, chicken curry and naan, and outdoor seating. Yes, in an airport lounge! It was amazing. I could use more of this right now. The outdoor swing I 'hung out' in for a while. Another long flight later and I was back in SFO. This began my second Monday of the week, as International Date line magic resulted in my going back in time. I hope to go back to Australia and especially to New Zealand now that I've experienced this part of the world! Thanks! Yeah - I've always been a little afraid of dim sum, haha. I'll have to try again, the AU one was a little prawn heavy! I am not at all jealous of this post. Not at all!